Are Gender Specifying Options In Social Media Necessary? As the coin has two sides, so are the topics for discussion. The pros and cons never let you reach a conclusion that one opinion is correct. You cannot conclude that one opinion is right over the other. Have you ever wondered why the social medias ask for gender? Some say it’s a good way of marketing products. Gender based products are easily targeted, especially beauty products like fairness creams, shampoo etc. Even men aren’t spared. In fact, nowadays they seem to have stepped ahead in taking care of their beauty. Gender products are promoted through the “liked” pages in Facebook. Haven’t you noticed that you stop when you see repeated actions? There lies the trick. 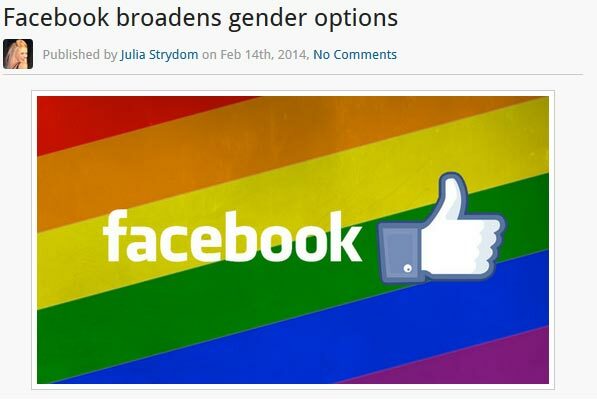 When Facebook introduced new and more gender specifying options, the commotion arose. From the normal options of men/women, trans genders were also included. Though many of them meant the same in a way, yet they gave more detailed options. This was claimed to be correct by the so-called group and they felt there is nothing wrong or unnecessary in the social media progress. They are also part of the society who deserve attention like the common pool. The response from the public was astonishing that it forces you to rethink. Do we really need to specify gender? What is the need of including the relationship status too? The “numerous” options in facebook force you to ask yourself these questions. Since the platform is for communication, and getting to know each other, these might be factors that have to be considered – a statement from some other supporting group. Facebook says people visit and get connected with others whom they care about. It was the reason for including more options, so that they could express who they really are. For rest of the crowd, this was unnecessary. A frequent Facebook user says that your privacy will be lost while the company earns profit. They consider it as a means of promoting company products since their personal details are sold to the advertisers. It’s how you manage with all these spams that let you stay in the social media site. Different opinions take longer to settle and arrive at the suitable solution. With the majority being common man and woman, it would be hard to implement this (large number of gender options) now, except in the U.S. Other websites still give the binary option, either male or female. For those who see the positive side, are always the ones with better solutions. In the course of time, lets hope Facebook will provide answers to all these questions and bring out what is good for the entire community.